BRAGGS -- A Pryor man was killed Monday afternoon when a small experimental aircraft he was flying hit a power line and crashed at Camp Gruber. Oklahoma National Guard Staff Sgt. Robert Louis Harding, 45, was pronounced dead at 5 p.m. Monday at St. John Medical Center in Tulsa, where he had been transported following the 12:30 p.m. crash. Oklahoma Highway Patrol Lt. Gary Rogers said Harding's homemade aircraft had been airborne for about one-half mile before clipping the power line and crashing upside down on Central Europe Road. Col. Charles Frasier, chief of staff of the Oklahoma National Guard, which oversees operations at Camp Gruber, said the Federal Aviation Administration would begin investigating the crash Tuesday morning. Camp Gruber is an Oklahoma National Guard training site. Harding worked at the Whitaker Education Training Center in Pryor. An employee of Mid-America Aviation in Pryor said Harding was an excellent pilot with more than 20 years flying experience and had at least 100 hours flying time in the light single-engine plane. The employee, who asked to not be identified, said Harding's plane, while considered experimental, was FAA certified. "My kids have flown with (Harding), a lot of people around here have. I've flown that plane. There was nothing wrong with it," the employee said, adding that he hadn't seen Harding depart Pryor earlier in the day. Copyright © 2002, World Publishing Co. All rights reserved. On May 15, 1995, at 1230 central daylight time, a Harding 1500-R-Mini-Max, N366RH, was destroyed following a loss of control during takeoff near Braggs, Oklahoma. The private pilot sustained fatal injuries. The local personal flight was being operated under Title 14 CFR Part 91. Visual meteorological conditions prevailed and a flight plan was not filed. Witnesses (statements enclosed) reported that at about 1130, the airplane landed on a grass area normally used as a helipad at Camp Gruber (Oklahoma National Guard Training Site). The pilot was a member of the Oklahoma National Guard. Several military personnel talked with the pilot and looked at the airplane. The pilot started the engine, initiated an uphill takeoff roll to the north, and then aborted the takeoff. Several witnesses reported that the airplane didn't have enough speed to takeoff. Subsequently, the pilot reversed the direction of the takeoff and initiated a takeoff to the south in a downhill direction. Witnesses reported that the pilot "forced" the airplane into the air and maneuvered to clear buildings as the airplane climbed "slowly" to 60 to 75 feet. One witness stated that "the aircraft appeared to be lacking power." Witnesses observed the airplane flying over the barracks and then up and down prior to entering a left descending turn. The wing hit a powerline wire about 20 feet above the ground as the airplane descended uncontrolled, impacted the terrain and separated into numerous pieces. Witnesses further reported that it didn't "appear" that he was having any control problems. Temperature was 83 degrees Fahrenheit with a calculated density altitude of 2,200 feet. The Federal Aviation Administration (FAA) inspector reported that the winds were from the south at 3 to 5 knots with a terrain downslope of approximately 10 degrees. Flight control continuity was confirmed, the propeller blades were shattered and the FAA inspector stated that the "aircraft appeared to be producing power on impact." The right wing exhibited physical evidence of a wire strike and one end of the highline cable was pulled loose approximately 20 feet above the ground. On October 28, 1994, the private pilot/builder was issued the FAA special airworthiness certificate with operating limitations requiring 40 hours of flight test. The pilot logbook showed the first test flight was conducted on November 6, 1994. Logbook entries for December 24, 1994, stated that the "plane has been tested in all areas and is proven safe" and "40 hours has been flown." Autopsy and toxicology were not performed. The airplane was released by the FAA to the personnel at Camp Gruber, Oklahoma. "Other Web sites carry photos of a Ryder truck parked at a military installation in Oklahoma, where conspiracy-minded investigators contend the fertilizer bomb was assembled. The Oklahoma National Guard confirmed Friday that the aerial photos were indeed taken above Camp Gruber in the fall of 1994 and said the classified project involved weapons sensors and was overseen by the Defense Advanced Research Projects Agency. The National Guard's statement said the truck 'had no association whatsoever with the tragedy at the Alfred P. Murrah Building." I'm not quite following you here. 'Splain please? Oklahoma National Guard Staff Sgt. Robert Louis Harding died May 15,1995. He had been employed with the Oklahoma Army National Guard Det.1 Company B, 120th Engineering as a facility engineer. A facility engineer, Oklahoma National Guard Staff Sgt. Robert Louis Harding, crashed and died in his Harding 1500-R-Mini-Max, N366RH on May 15,1995 a very short distance from where the photo of the Ryder truck was taken. It is clear from the picture that it was taken from the air. The source of the photo is unknown, but it is clear Staff Sgt. Harding spent some time in the air and had a particular interest in this area. From the Washington Post article, it appears the photo is genuine. That's about all I can conclude from the articles posted here and the photo. Ya mind explaining how a seven-year-old aircraft crash is "News/Current Events?" It is not a current event, it is a "News" article. Is there a restriction on posting an old "News" article? 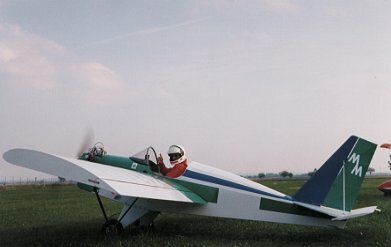 It's a thread for aviation buffs and especially those interested in experimentals, like a Harding 1500-R-Mini-Max. I always wanted one, but they appear to have a mixed history. Just like JFK jr, the guy died in an ugly airplane. Please, fellow Freepers, Do not soil our freedom to fly by building an ugly airplane. There is always a "Right to Choose"
A beautiful airplane may not be fast, but ugly is always slow. Although I just ripped on them, I have a friend that was building one. I don't think he ever finished. I think you'll find ultralights and semi-ultralights all tend to have a mixed history. Have you considered the Titan series? No, I am looking for something with least amount of work. I talk to guys working on them and it's the same story, "it's been a year now, but I should have it done in another six months." This still looks like a good option for me. The report states Sgt. Harding landed this on a helipad and then tried to take off. If that's the case, I don't think I can fault the plane. Do you have a private pilots liscence? You don't need a license for the ultralights, do you? Where goes the FAA draw the line between ultralight aircraft requiring a license and a check out and those that don't?